Place the beef or lamb mince, onion, garlic, egg, breadcrumbs and lemon rind and a little pepper in a large bowl. Using your hand bring the mixture together and knead until combined. Shape small spoonfuls of mixture into small meatballs. Make the meatballs small – about 2 teaspoons of mixture for each. Lightly brush or spray meatballs with a little oil. Heat a non-stick frypan over moderately-high heat. Cook the meatballs in batches over a medium-high heat, until golden and cooked through. Drain on absorbent paper. Allow the pan to reheat between batches. Cook the pasta, adding the broccolini in the last few minutes of cooking. Drain and return to the saucepan with the olive oil, lemon juice, cherry tomatoes and meatballs. Gently mix and then serve. Use any green vegetable instead of the broccolini. Meatballs and burgers should always be thoroughly cooked. They should not be served rare or pink. A good guide is to insert a skewer into the thickest part; if it is ready to eat the juices will be clear. Freeze mince you don’t intend to use. Uncooked mince can be frozen for 2-3 months. Rather than freezing loose mince in roundish shape as bought from the butcher lay it out flat to freeze. Thaw frozen mince (and any meat) in the fridge, on the lowest shelf below and or away from any ready to eat food. And only thaw in the microwave if using the mince immediately thereafter. 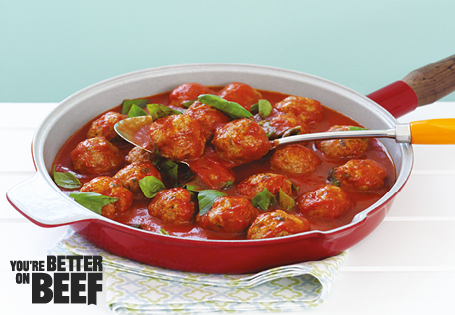 TIP * You can make these yummy meatballs with beef or lamb mince. Serve with small pasta shapes to match the size of the meatballs.